Mish's Global Economic Trend Analysis: Third Party Logistics: Will Amazon Disrupt UPS and Uber or Will Uber Disrupt Amazon, FedEx, and UPS? Third Party Logistics: Will Amazon Disrupt UPS and Uber or Will Uber Disrupt Amazon, FedEx, and UPS? Last week Uber rolled out on-demand delivery in New York, Chicago, and San Francisco. Or Is Amazon About to Disrupt Delivery Services by Taking UPS and FedEx Head On? Colin Sebastian at RW Baird published a note yesterday highlighting the opportunity for Amazon to begin to offer third-party logistics services in a similar way that it offers Web Services. The analyst believes that this could be a $5 billion opportunity for Amazon even if it only captures 1% marketshare in the various segments of the industry. 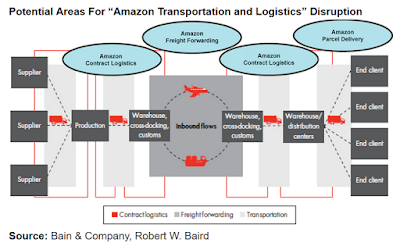 Transportation and logistics is the next massive market opportunity for Amazon but rather than developing it as another internal business unit, this may be spun out. Amazon currently operates 167 distribution facilities around the world, totaling more than 100 million sq. ft., and continues to grow. In North America, Amazon operates 92 facilities (including local sortation centers). Amazon’s third-party Marketplace is a good example which leverages the scale of Amazon’s e-commerce traffic and supporting fulfillment infrastructure. Amazon is not finished disrupting industries. Just as Amazon leverages infrastructure behind the core retail business to grow AWS and Marketplace, there is evidence the company may extend its increasingly complex and technology-centric logistics and delivery platform as a third-party offering. Uber - Not Public - Valued at $70 Billion after raising still more cash. Any of those valuations seem ridiculous?